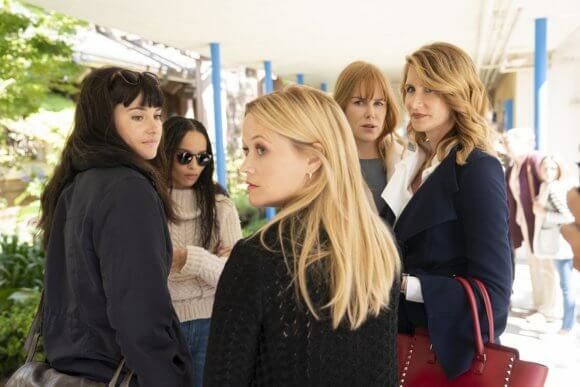 HBO’s set a June 9, 2019 premiere date for season two of the critically acclaimed dramatic series, Big Little Lies, and the network’s unveiled an official teaser trailer. The second season of the award-winning drama will consist of seven one-hour episodes airing on Sundays at 9pm ET/PT. Returning season one cast members include Reese Witherspoon as Madeline Martha Mackenzie, Nicole Kidman as Celeste Wright, Shailene Woodley as Jane, Laura Dern as Renata Klein, Zoë Kravitz as Bonnie Carlson, Adam Scott as Ed Mackenzie, James Tupper as Nathan Carlson, Iain Armitage as Ziggy, Robin Weigert as Dr. Amanda Reisman, and Jeffrey Nordling as Gordon Klein. Newcomers include Meryl Streep as Mary Louise Wright, Douglas Smith as Corey Brockfield, Crystal Fox as Elizabeth Howard, and Mo McRae as Michael Perkins. Season two was directed by Andrea Arnold (Red Road, American Honey). Arnold also serves as an executive producer along with Nicole Kidman, Reese Witherspoon, David E Kelly, Jean-Marc Vallée, Bruna Papandrea, Per Saari, Gregg Fienberg, and Nathan Ross. In addition, Big Little Lies author Liane Moriarty is involved as an executive producer. David E. Kelley wrote the season two teleplays. The first season earned 16 Emmy nominations, winning in eight categories. It also picked up four Golden Globes, two Screen Actors Guild Awards, four Critics’ Choice Awards, and a Directors Guild Award.